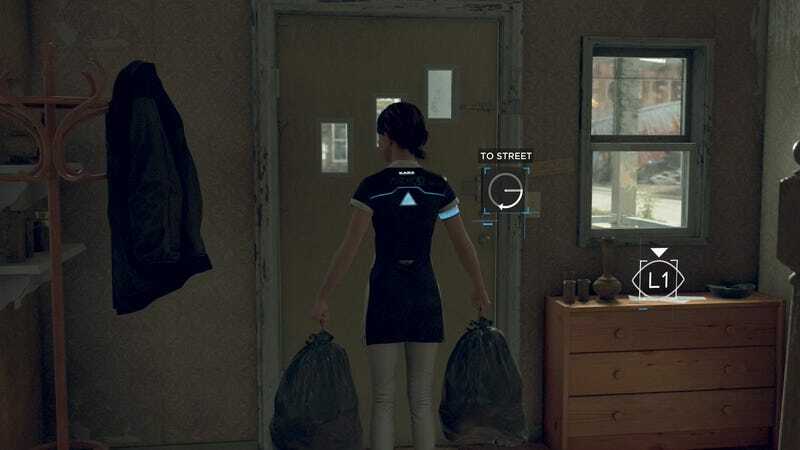 This feeling of injustice is amplified with the caretaker android, Markus, who gets destroyed by his rich owner’s son and discarded in an android junkyard. The sudden shift from affluent manor to android hell is one of the most visually gut-wrenching scenes I’ve played. Broken pieces of robot dross are scattered everywhere. The sense of despair and horror is palpable, as Markus has to crawl without legs through the muddy trash field. His hearing devices are impaired, so everything is muted. He finds parts to try to fix himself and has to make his way through a tight corridor filled with android hands trying to grapple him, all vying for their lives. His descent into death and back symbolises his emergence as an android messiah figure. Events in the virtual household took a dark turn as we came to realise that Todd is mentally unstable, an abusive taking out his personal anguish violently on his daughter. 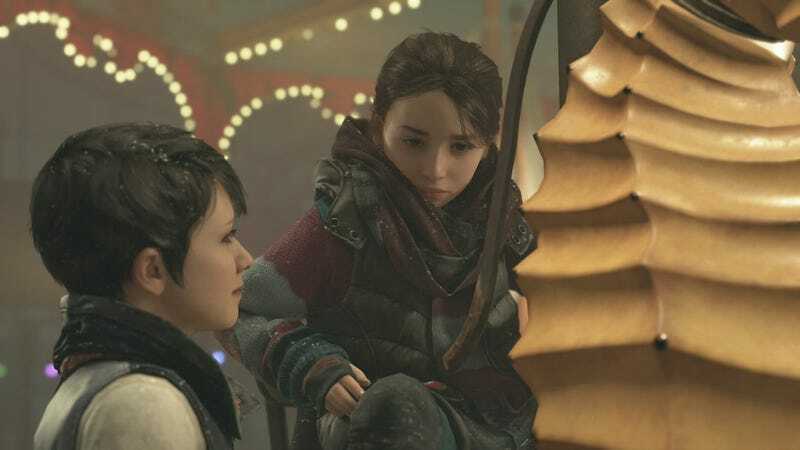 In chapter 6, when we realised he was going to hurt his daughter, we chose for Kara to step in and rescue her, killing Todd in her moment of deviancy. From then on, they had to go on the run. 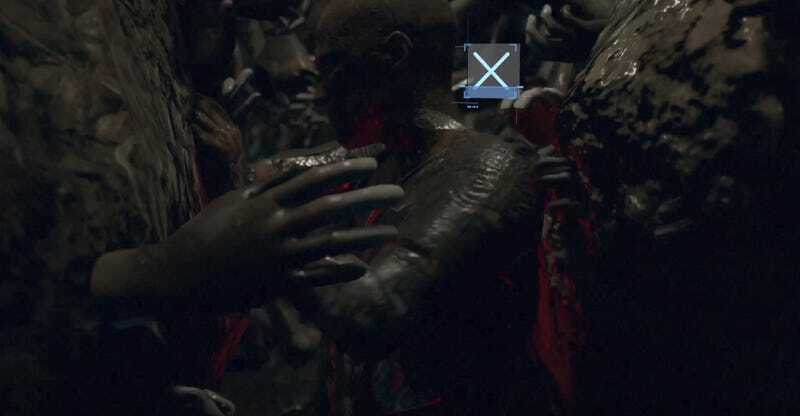 Throughout the game, there are mysterious allusions to a mythical figure worshipped by the androids called rA9. 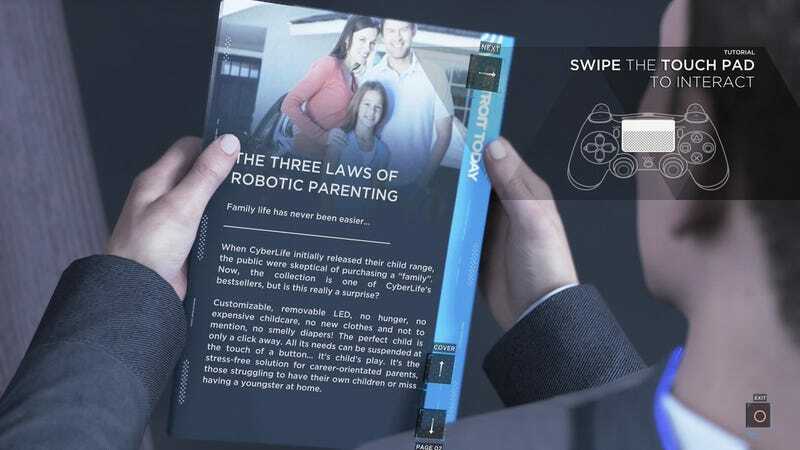 I had thought rA9 would eventually become an integral part of the story and a big reveal would somehow be connected to the robot revolution. But on my two playthroughs, rA9’s identity was never actually revealed. After finishing the game, I realised, that was sort of the point. rA9 can be anything to anyone, whether religion, a hobby, even an addiction—some way to endure what feels unendurable. I should have connected the dots, but I was slow on the uptake thanks to my zombie baby brain. 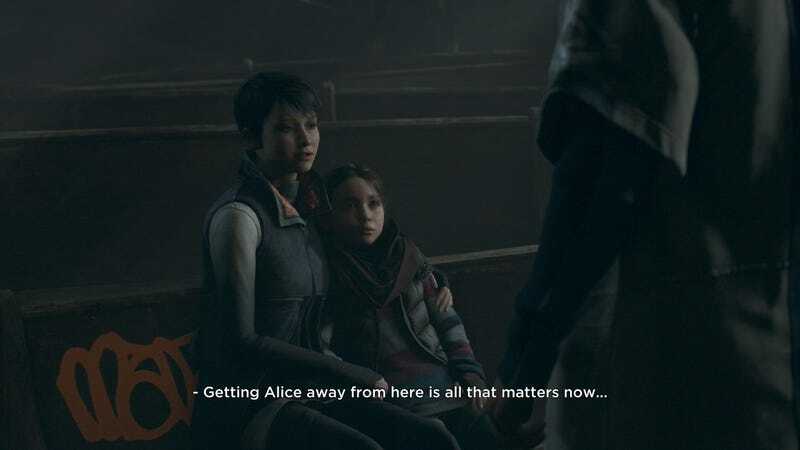 We were both in for a big surprise when Kara is faced with a stunning realisation: the girl she’s been protecting, Alice, isn’t actually human, but a robot like herself. Before that, there was something that felt sacred in Kara’s mission, almost as though protecting a human made her more human. But in that moment, faced with the reality that Alice is just one of many robots, we weren’t sure what the proper reaction should be. 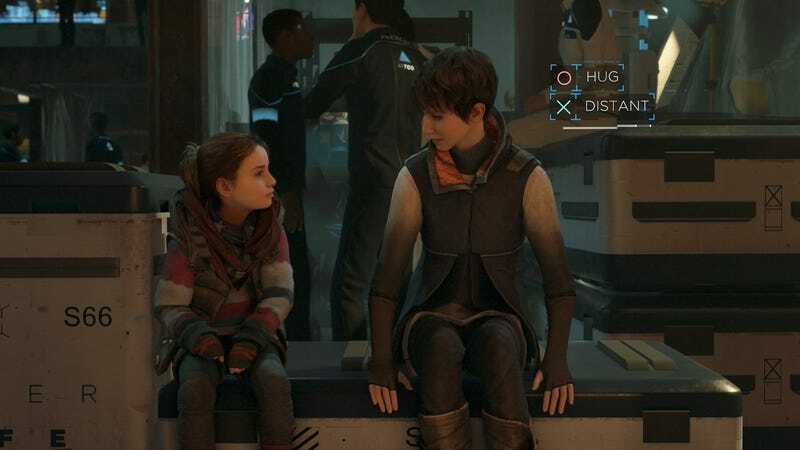 A fellow android, Luther, asks the poignant question: “Do you love her any less now that you know she’s one of us?” Would a human mother still be capable of loving a robot daughter? I asked Angela what she would do if she found out our baby was a robot. It was another interesting conversation, to say the least. Detroit’s “good ending,” if it can be called that, isn’t so much about “becoming human” as it is about surpassing them. You can opt for one of the more violent endings, waging war against the humans and getting your characters killed. In that case, the androids fulfil the bloody legacy of humanity perfectly. 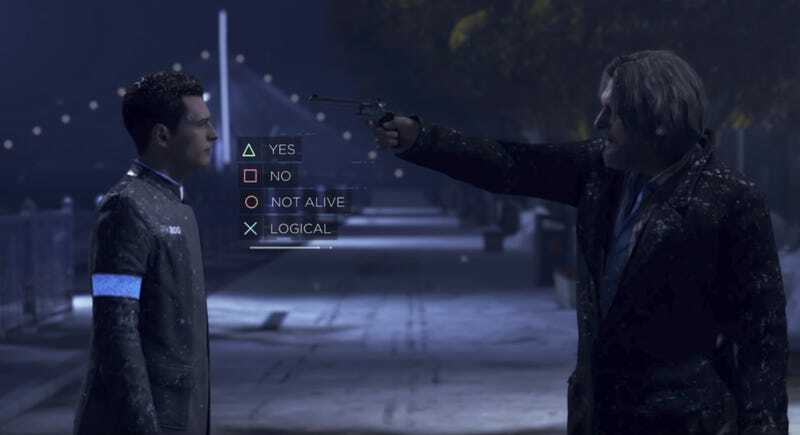 The fact that the choice is yours is one of the most compelling parts about Detroit and the reason why, all this time after finishing, we still think about the themes behind it.